This is surely a hard one to pigeon-hole. 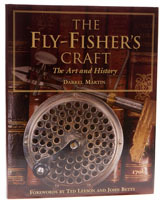 Part history book, part fly tying manual, partly a work of philosophy, and partly a showcase for Martin’s methods, with some a long section at the end about how to make a horsehair line, your own hooks and a loop rod. OK, so you might argue that all this wisdom comes four centuries too late for the people who would have been really been able to make use of it, but I would counter that you would have to look around for a long time before finding so much useful information in one place; the book is as fun as all got out; the reproduction is superb and I love it to death. If you want something to read over the long winter months, this is one to put on your list for Santa and if at the end of it you don’t understand a lot more about how we got to where we are today, then I suggest you read it again. More, please.